LA Compost Description: LA Compost has spent the last five years, building and facilitating composting hubs throughout LA County. LA Compost has successfully built 12 compost systems throughout LA County, with 5 more in the process of completion. 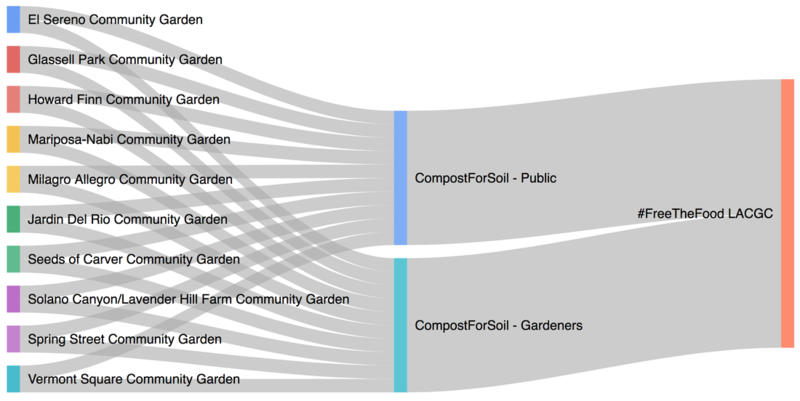 The LA Compost team consists of Certified Master Gardeners, Master Composters from the NYC Composting project, former teachers, restaurant managers, and graduate level students with a concentration in soil science. LA Compost aims to keep the transport of organics local and its mission is to reconnect the people of Los Angeles to the soil, and each other. LA Compost has established best practices for the physical construction, compost maintenance, education, and necessary support. Its decentralized system works with regional managers and partnering organizations in a symbiotic relationship while empowering and providing resources for individuals to form a community and maintain the work. LA Compost has firsthand knowledge of the demand for local compost drop-off sites as well as the LA community’s desire to participate in and engage with composting programs. LACGC Project Description: LA Community Garden Council to work together to build composting hubs at ten community garden sites. The composting hubs will serve the community gardeners as well as being open to local residents and business owners for a couple of hours each week for them to bring their kitchen scraps. The Hubs will serve as educational centers, with clear signage and workshops, to encourage community members to avoid food waste, to compost their garden and kitchen scraps, to use the compost to nourish their plants, and to grow their own food. LACC, LA Compost, and LACGC anticipate their program will impact 1,400 people. They expect to see food savings of approximately 2,000 pounds per month at each composting hub, for a total of 40,000 pounds during the 60-day challenge period. NOTE: They achieved 2,200 pounds during the grant challenge period, with the target to be reached as each 3-bin system at each garden site is launched. LACC Project Description: The LA Conservation Corps, LA Community Garden Council, and LA Compost will work together to build composting hubs at ten community garden sites. The composting hubs will serve the community gardeners as well as being open to local residents and business owners for a couple of hours each week for them to bring their kitchen scraps. The Hubs will serve as educational centers, with clear signage and workshops, to encourage community members to avoid food waste, to compost their garden and kitchen scraps, to use the compost to nourish their plants, and to grow their own food. LACC, LA Compost, and LACGC anticipate their program will impact 1,400 people. They expect to see food savings of approximately 2,000 pounds per month at each composting hub, for a total of 40,000 pounds during the 60-day challenge period. NOTE: They achieved 2,200 pounds during the grant challenge period, with the target to be reached as each 3-bin system at each garden site is launched.